Even if newspapers were already comparing Brexit to the Lehman collapse, the FTSE Index ended the month of June up +4.4% and the MSCI World Index slightly down with a return of -1.3%. Global equity markets experienced a volatility spike during the now famous “Black Friday” but the MSCI World Index already reached June 16th levels only 3 days after the vote. At the other end – supposedly – of the risk spectrum is the world of Government Bonds. This was the place to be invested since the start of the year and for a long time now. If you look at EFFA Indices, US Bonds with maturities above 10 years are up +15.2% YTD as of the end of June, EUR Bonds +14.1%, GBP Bonds +20.1% and CHF Bonds +14.9%. The 30y Swiss Government Bond shows a negative yield of -0.11% as of July 6th. More than USD 10 tn of worldwide debt is now yielding in negative territory. 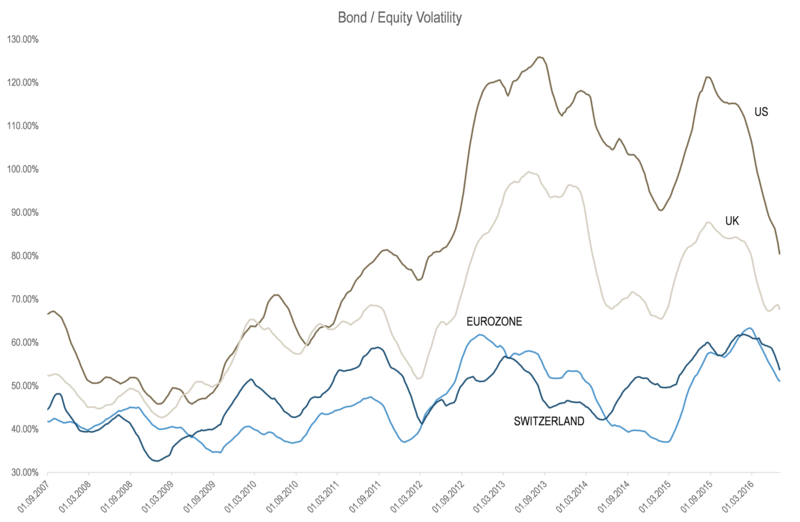 Coming back to Brexit and market volatility, the chart displayed above shows the moving average of the ratio of bond volatility to equity volatility for the US, UK, EU and CH markets. Since mid-09 and the start of the equity market rally we can see an increase of bond volatility versus equity volatility. The ratio for EUR and CHF has remained in a range between 0.4 and 0.6, in line with its historical average. However the ratio for UK and US markets has significantly increased during this period. Since mid-2012 the ratio for the US has frequently been above 1, meaning that being invested in the US T-bond market today could potentially be a riskier bet in terms of volatility than having an exposure to the S&P 500 Index.